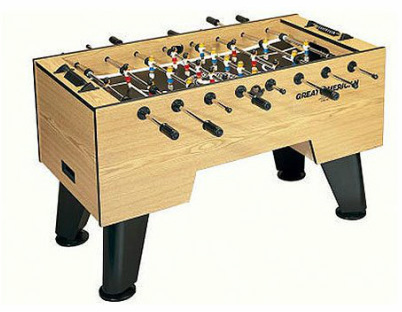 The American Soccer is built to withstand the rigors of constant commercial foosball play. It's made with commercial reliability and dependability in mind but at a price that makes it affordable for home game rooms. 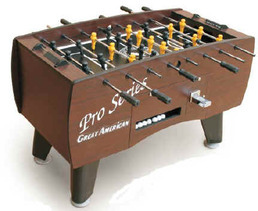 Great American Foosball Tables are made with pride in the United States. Black ABS Injected Legs with Leg Levelers for Added Stability. 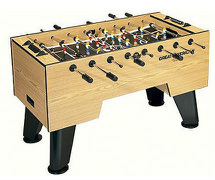 Choose One or Three Foosball Goalies with Break Resistant Polypropylene Players. 3/4'' Particle Board Cabinet with Oak Wood Veneer Finish. Solid Chrome Steel Rods with Medium Sized Handles. 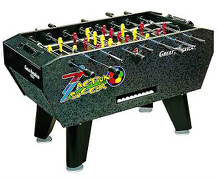 Includes Table-Top Abacus and 3 Soccer Balls. The American is priced at around $775 US.